This article provides an overview of the geopolitical situation in Northern Syria. We’ll look at the history that led to the Turkish Olive Branch operation in Afrin governorate and the changes that have emerged due to the aforementioned campaign. American foreign policy in Syria is marred by contradictions. The US is currently allied with both Turkey and the SDF (Syrian Democratic Forces) along with Kurdish YPG forces. This is becoming increasingly problematic as Turkey and the SDF clash over territorial claims. 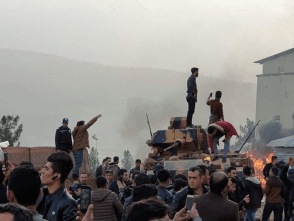 Turkey feels betrayed by Washington which, in Turkey’s view, is providing heavy arms to an extension of the PKK (Kurdistan Workers’ Party), a group viewed by Ankara as an enemy terrorist organization. In turn, the SDF are aware that the US might pull support, as Turkey is a very important NATO (North Atlantic Treaty Organisation) partner. This has forced the SDF to maintain somewhat-friendly relations with the Syrian government and Russia. Turkey’s objections towards the SDF and YPG aren’t entirely unjustified if the YPG’s membership in the Kurdish Council of Communities (KCK) is taken into consideration. Since NATO is far more important than the YPG, the US-YPG alliance remains problematic for Washington. But how has this situation even come to life? For the USA, the Manbij offensive was simply a preparation for cutting off Islamic State core territory from the outside world, as IS received most of their foreign fighters and supplies through porous sections of the Turkish border. Manbij and al-Bab needed to be captured before any offensive on al-Tabqah and ar-Raqqa on either side of the Euphrates could be started. The US had tried to capture the area in collaboration with Turkey and FSA rebels between March and June 2016, but this ultimately failed. Despite Turkish and US support, the rebels were ineffective against IS and were easily distracted as they struck the YPG in Afrin several times. These rebels were also hostile towards the US and confronted US troops supporting them.10.“Conflict among U.S. allies in northern Syria clouds war on Islamic State” : Reuters11.“American commandos ‘forced to run away’ from US-backed Syrian rebels” : The Telegraph At the same time, as the rebels in Northern Aleppo were stuck against IS, the SDF made vast gains, capturing Manbij and its surrounding countryside. This in turn led to increased Turkish support for the rebels and the creation of the official TFSA, putting them in conflict with US plans. The offensive for Raqqa formally started on 6 November 2016 and relied heavily upon the YPG and the SDF.12.“US ‘in close contact’ with Turkey over Raqqa assault” : al-Arabiya13.“Raqqa Fight Starting ‘Soon’, Isolation Operation to Include YPG” : VoA News Turkey proposed to the USA an alternative force, a Sunni Arab infantry force supported by Turkish Special Forces, artillery and tanks with heavy US-backing. It essentially proposed the same force that it used for its Euphrates Shield operation, but with US troops. Militarily, the Raqqa operation went smoothly for both the SDF, as well as the US, though at a high cost of civilian casualties and large destruction to the infrastructure of the city. After Raqqa, the SDF continued to conquer IS territory along the Euphrates Valley towards Deir ez-Zor, capturing several large oilfields along the way. The Islamic State was a shell of its former self, and defeated in all but name. This is the point where, for the US, a future opposition towards Iran and by extension all government troops, became an important goal. In turn, this led the SDF into conflict with Russia and the Syrian government. The previous friendly approach by Russia towards the SDF can’t be upheld if the SDF becomes a true US proxy. This probably changed the Russian approach towards them, as in the past Russia supported Afrin in various ways, stationing soldiers, training SDF troops, and conducting air-strikes to assist them. The start of the Turkish “Olive Branch” operation, the invasion of Afrin, laid bare the cracks within each respective political camp. The YPG is now in open warfare with Turkey, the NATO ally of their main supporter. Turkey’s rhetoric vis-a-vis the US is becoming increasingly belligerent while the US have remained rather silent on the whole ordeal other than a few vague news releases.16.“Turkish President Erdogan offers US ‘Ottoman slap’ ahead of Rex Tillerson’s visit” : The Independent17.https://twitter.com/abdbozkurt/status/96676744200453325718.“Mixed Messages From U.S. as Turkey Attacks Syrian Kurds” : The New York Times So far, Washington has yet to outright condemn Turkish actions, but they also have not stopped, or even attempted to stop YPG reinforcements heading to Afrin to fight Turkey. The US are keeping themselves rather secluded from this whole ordeal and are acting neutral in the interest of covertly maintaining their previous strategy. The Afrin operation would have been much harsher on the Turkish forces without the Russian green-light for it.19.“De Mistura: Syria talks in Vienna at ‘critical moment’ : Al-Jazeera They opened the Syrian airspace for the Turkish Air-Force, pulled their own soldiers from Afrin, and have yet to publicly condemned the operation. They have blamed the US, accusing Washington of having “caused Turkey’s ire with their unilateral decisions”. Syria, on the other hand, threatened to shoot down Turkish planes and condemned the operation as an illegal invasion in spite of Russia’s green-light. For the government, the operation definitely poses a threat as it would link up the Idlib and Northern Aleppo rebel territories. After a series of defeats the rebels would not only gain a much needed moral boost, but they’d also control a formidable amount of territory again. So far, Russia has achieved half of its goals in Syria . The Assad government is stable and isn’t going to be toppled by external or internal threats any time soon. A bigger rebel base in Syria under strong Turkish influence hostile towards the SDF is a small price to pay for increasingly close cooperation with a major regional power with a long-term possibility of pulling them out of NATO. Having seized Afrin, Turkey will set its sights on Manbij soon, and Russia certainly won’t hinder them, as they can only win politically in such a conflict. If the non-Afrin YPG gets attacked, the US won’t be able to stay neutral and act as if it doesn’t concern them, as they have far more stock in Manbij than they did in Afrin. For the Syrian Civil War, this scenario means that another chapter of the war is being written. By now it is clear that pro-government forces will attempt to take back all rebel pockets within the country without much outside interference. Idlib and the Turkish controlled rebel territory will remain for now, but for them, the YPG is the biggest concern and Afrin certainly won’t be the last line of Turkish actions. Rather than fizzle out, the Syrian Civil War has entered a new epoch as external actors make clear their changing agendas.